Dr. Brown's Deluxe Bottle Warmer takes the stress out of warming bottles, ensuring that they are warmed safely and efficiently. It comes with an easy-to-read LCD control panel and easy-to-operate keypad. The LCD screen which is visible during both day and night and an audible alarm intimate when the warming cycle is complete. The programmable cycle can be started with just one button for quick bottle warming and has a cycle memory to repeat preferred heating time. It is also easy to adjust the time needed to warm different size bottles. The refillable water chamber has an easy to view water level. There is no need to empty the warmer between uses and the chamber only requires refilling after several bottles have been warmed. 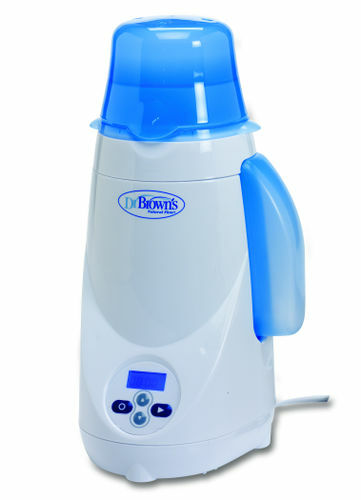 The convenient electric steam warming system of this warmer fits all Dr. Brown's bottles and most other bottle brands. About the Brand: At Dr. Brown's, the focus has always been to create innovative baby products to promote good health and optimal nutrition. With best baby products supplied to hospitals and NICUs, Dr. Brown's is a favourite amongst moms worldwide, quite certainly for its quality and class.